Repetitive tasks and escalating tension are a potent combination. Why aren't there more anthologies in games? When I watch an episode of Black Mirror, or HBO's Room 104, or a classic installment of The Twilight Zone, it's like opening a present. You might get a brilliant, unsettling parable that stays with you for years, or you could get a tedious saga about robot bees that kill arseholes on Twitter. I'd love more of the unexpected in games, and that's what Stories Untold did for me this year. Each episode, framed as part of a TV anthology within the game, showed me something I didn't see coming. I knew what episode one was about before going into the game. 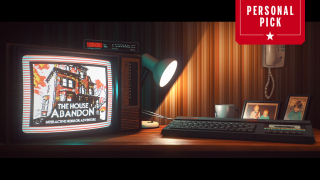 In The House Abandon, you play a text adventure inside the game where you explore a house. It soon becomes clear your actions in the text adventure affect the environment around your character in the game, and every flicker of the desk lamp shits you up. Then the next episode is completely different. And so's the next one, which makes you move around the environment for the first time, at a moment where you want to do anything but leave the spot you're sitting in. Stories Untold makes you perform repetitive tasks, tuning a radio frequency, or working out which text commands will help you progress. There's a bit of trial-and-error and a lot of double-checking. The whole time, you're waiting for something awful to happen, until the tension becomes a bit much. You're also left to ponder what connects its settings beyond front-and-centre use of '80s technology: the house with the computer, the lab, the arctic station, and the strange happenings that occur across each one. There are clues throughout, and you'll likely guess some part of the conclusion you're drifting towards, but the journey is unsettling and exciting. I won't say any more than that about each episode. Like I said, you're opening a present each time—and the surprise should be preserved. Stories Untold comes from indie developer No Code, featuring Alien Isolation's lead UI artist Jon McKellan, and anyone who's played both games will see some of the same strengths carry over. The way antiquated technology can be used to evoke a particular feeling comes to mind, as does the use of sound design. I hope it inspires other developers to create anthology series. As the format's popularity is spiking again in TV, Stories Untold shows how much potential there is in changing game styles between episodes while retaining a consistent atmosphere. What if the next BioShock was five different episodes set before the fall of Rapture, maybe made by different developers each time? Could BioWare make a Mass Effect that shows multiple playable characters affected by the same event? Even Battlefield 1's War Stories show that big publishers are willing to think about the potential of the format. Stories Untold is the game I've recommended the most to relatively new PC players this year, and I can't wait to see what No Code does next. If you're thinking of picking it up for the holidays, it normally costs a mere $10/£7, and you'll find it for even less during the Steam sale. It's so worth it.